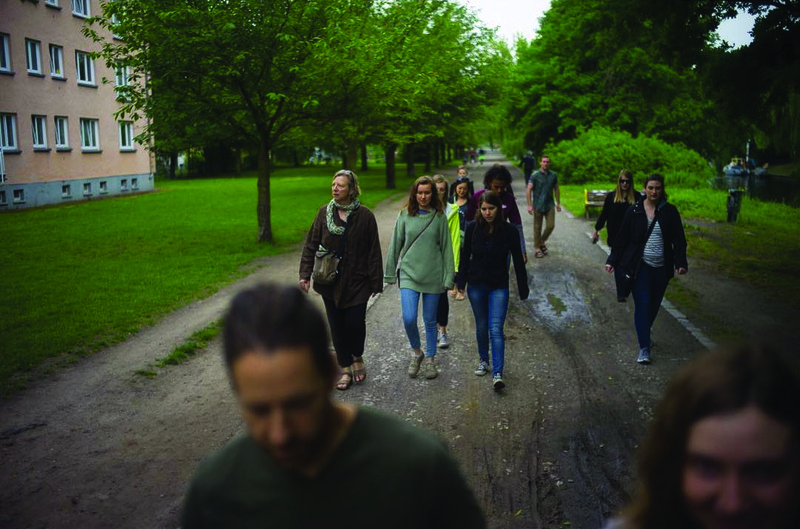 The group explores their new neighborhood along the Landwehr Canal in Kreuzberg ,Berlin. They came by plane and by train and by foot, a dozen and a half of them, carrying bundles and suitcases and keepsakes, looking tired but relieved to have arrived in Berlin. No, these are not refugees, they are UM Journalism students, 18 of them, here on a study-abroad trip for the next three weeks. The disorientation many of them feel will be helpful as they begin to meet and study the challenges facing thousands upon thousands of refugees who made their way to Germany. The refugees’ goal is to escape war and find peace. The students’ task, a bit simpler, is to produce a series of articles about how the refugees adjust to their new situation. The students are staying in a neighborhood called Kreuzberg, which has long been a crossroads for immigrants to this country. For decades, it was home to the Turks who came here during a big labor shortage in the 1960’s and 70’s, and helped Germany recover from war and become Europe’s strongest economy. Once Kreuzberg was a ghetto, but it has turned into a multicultural experiment, a mixing bowl where no one stands out as an outsider. As students are learning, many new refugees are finding their way back to this neighborhood. Kreuzberg has resisted the commercialization that has seized much of Berlin since the reunification of Germany in 1990. Since the refugee crisis spiked last year, things have calmed down quite a bit, and the number of new arrivals has dropped dramatically. But as one pro-refugee activist told students today, refugees face months or years of adjustment as they come to grips with their new lives in Germany, and learn whether or not they can stay and prosper. Our students will begin to chronicle that adjustment, with articles appearing in this space and elsewhere in the coming weeks. Stay tuned. Back in July 2014, Associate Professor Lee Banville mapped out all of the best coffee shops in Missoula after signing the contract for his next book. His romantic vision as a writer disappeared when he realized that his 10,000 word-per-week quota could only be met from the basement of the Maureen and Mike Mansfield Library at the University. Now, 788 pages later, Banville’s work is in the hands of Praeger Press, who will release the two-volume encyclopedia in October 2016. 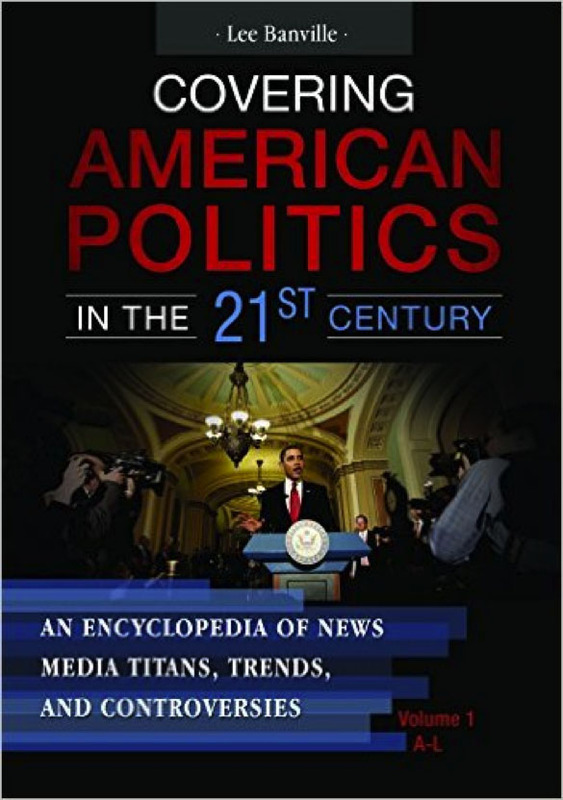 Titled Covering American Politics in the 21st Century: An Encyclopedia of News Media Titans, Trends, and Controversies, the book tackles topics like the role of money in elections, how social media has increased the personalization of the Internet and the roles of female reporters on the campaign trail. Banville witnessed the digital revolution first hand, between the 1996 National Convention in San Diego, covered with “traditional media by the nth-degree,” and the 2008 elections, when he was at Grant Park in Chicago and saw President Obama give his victory speech. Banville started working in the newsroom when he was 22 and living in Washington, D.C. He spent 14 years with PBS NewsHour as an online editor, but realized he missed working with people who were still “pretty green to journalism” and could adapt more quickly to evolving technologies. 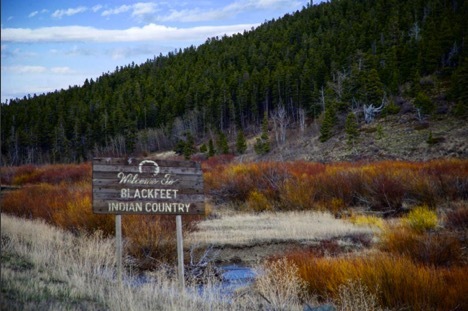 The constant bustle of Washington, D.C. also made Banville wistful for the mountains, so when a teaching position opened up at the University of Montana in 2008, he seized the opportunity, joining the School of Journalism the following year. Banville said the move definitely paid off. However, he still finds himself awake at midnight, watching the polls and eating frosted animal cookies during the primaries. 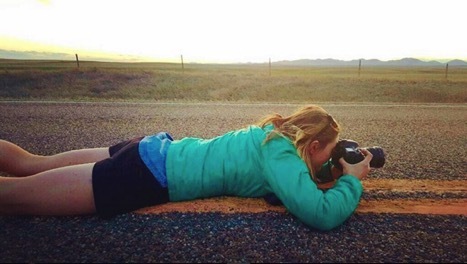 This election season Banville will be serving as an on-air political analyst for ABC FOX Montana to keep audiences informed about the issues at stake and their historical context. UM School of Journalism Assistant Professors Jule Banville and Jason Begay, as well as alumni Michael Wright, helped contribute to Covering American Politics in the 21st Century: an Encyclopedia of News Media Titans, Trends, and Controversies. Lee Banville is also the author of Debating Our Destiny: Presidential Debate Moments that Shaped History.